The Champion Sports Deluxe Electric Inflating Air Pump is a heavyweight professional deluxe inflator that will suit all of your ball inflation needs. 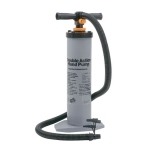 This deluxe air pump features a whisper quiet 1/4 HP diaphragm compressor that delivers up to 50 PSI. It is powered by an 8ft three prong 20 volt electric power cord and an on/off switch. Helpful features include a pressure gauge, needle, and hose. 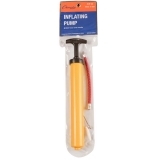 The Deluxe Electric Inflating Pump is UL listed for product safety and certification. The Champion Sports Economy Electric Inflating Air Pump is a great way to easily inflate all of your game balls quickly and effectively. This oil-less compressor features 1/10 horse power and 100 volts of power activated by a simple on/off switch. It is AC rated to 20 PSI and features a pressure gauge, an inflation hose, and adapters to fit different ball types. 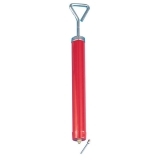 The compact and effective Champion Sports Double Action Hand Air Pump is perfect for inflating large items such as beach balls, rafts, exercise balls, or cage balls. It features a double action design, which releases air on both the up and down stroke. 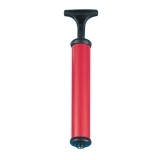 You can even take the hand pump with you in your exercise bag, beach bag, or P.E. equipment cart. 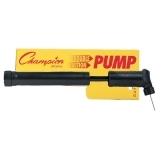 The Champion Sports High Volume Air Pump inflates and deflates quickly and effectively, as it releases high volumes on the up as well as down strokes. This is the ideal economical inflator for large inflatable items such as cage balls and therapy balls. 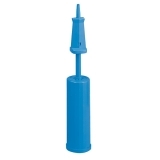 This pump comes with a large hose and valve adaptor, and can also be used as a deflator. 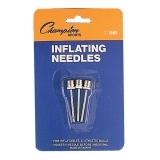 The Champion Sports Inflation Needle is ideal for inflating balls and sports equipment with bladders that require needle insertion. 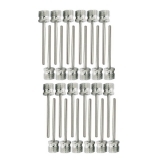 These inflation needles are nickel plated, screw into your pump for a secure fit, and are sold in a pack of three. 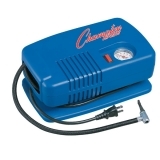 The Champion Sports Electric Inflation/Deflation Air Pump gives you two useful products in one! 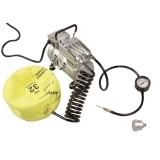 This electric pump allows you to inflate or deflate sports balls and features an oil-less motor, 1/8 HP, and 120 volt AC power with a power cord and on/off switch. 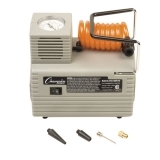 The Inflation/Deflation Air Pump has a maximum pressure of 50 PSI and includes a pressure gauge, 2 hoses, and an inflation needle. This product is CSA and CE Approved for compliance with national and international standards. 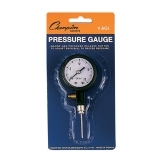 Always have just the right amount of pressure when inflating with the Champion Sports Pressure Gauge. The large dial is easy to read and a must have for adjusting each ball to its proper pressure. You'll never have to worry about under inflating or over inflating balls again.